SCCC was founded in 1966 by a group of dedicated individuals, lead by Psychologist Hans Hoffman and Dr. Ben Weininger, Psychiatrist. We began by training caring members of the community who were able and willing to volunteer as paraprofessional counselors. Homemakers, retirees, professionals in other fields—a wide range of compassionate, concerned people trained and served at SCCC, providing affordable counseling to anyone who needed it. 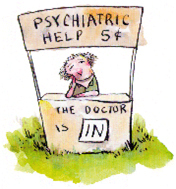 Inspired by Lucy in the Peanuts comic strip, Dr. Ben would to set up a ‘dialogue in the streets’ stand and charge $0.50 for a brief therapy session, to draw attention to the great need for affordable talk therapy services. Today, we are a non-profit counseling center and training facility where pre-licensed therapists provide counseling under the supervision of volunteer licensed professionals. In their two to four years with us, they experience multiple specialties and diverse psychological modalities as they earn their clinical hours, build their skills, and define their professional practices. Our model depends on volunteers. Our therapists-in-training and their licensed supervisors are volunteers. Many of our alumni return and volunteer regularly. Together, we provide over 40,000 hours of counseling each year, valued over $3 million. Volunteering our time and our skills frees SCCC to operate without taking insurance or government funding, reducing administrative overhead and eliminating the restrictions insurance can place on care. Because we volunteer, we are free to focus all of our resources on providing the best possible care for each person we serve. Join us in our work and donate today.